Universal Truck Equipment has been manufacturing “UNIVERSAL” snow plows and wings for 30+ years. Our main goals are QUALITY and CUSTOMER SATISFACTION! From start to finish, our employees take pride in what they do and our workmanship is second to none! We feel that we build some of the most heavy-duty equipment in the industry. We offer a variety of snow plows and wings for any application from a gravel road to an interstate highway. Our main customers are counties, cities, townships, villages and other municipalities. Along with them, we also do business with local contractors and private individuals, as well. Besides our manufacturing, Universal Truck Equipment is a dealer for many high quality brands of large and small truck equipment. From truck dump boxes, sanders and spreaders, platforms, grain bodies, axles, vibrators, tarps to pickup plows, lights, hydraulics, hitches and more. Our experienced staff in the shop can install any piece of equipment that is purchased from us. We also offer Rhino Linings, sprayed-on bed liners, shot blasting, priming and painting. Universal Highway Products started building snow plows in a small shop located in Trempealeau, WI over 30 years ago. 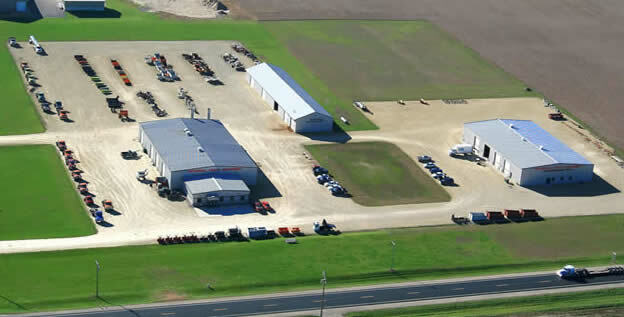 In 1994, the current owners purchased the business and renamed it Universal Truck Equipment, Inc. Our new facility was constructed in 1998 on the corner of Hwy 54/93 and Schubert Road between Centerville and Galesville, WI. Since then, we have been slowly growing and expanding. We added a pole shed for cold storage in 2001. And then again the following year added two more bays on to that, which are now our shot blast bay and Rhino Linings spray booth. An office and showroom was completed in 2004. In 2006 a separate building was built for the manufacturing department. This also opened up three more bays for set-up and repair work for our truck department. A 16ft 500 ton Accurpress Press Brake was added in 2010. The spring of 2011 brought more changes to Universal Truck Equipment, as an Alltra Plasma cutting system was installed. The 400 Amp Hypertherm Plasma is capable of cutting up to 3in thick steel on its 8ft x 16ft bed. Another cold storage pole shed was completed at the end of 2011.